Start by painting the surface of each of the wooden blocks. I chose to paint my blocks white to match the woodwork in my living room, but you may choose to stain or paint your blocks in other colors to match your decor. I’ve seen this done with black blocks before and I think it looks really crisp and nice as well. As the paint is drying, begin to cut out six rectangles from each of your patterned papers. Once the rectangles are cut you can go ahead and write out or stamp the letters on to each piece of paper. Once the paint has dried evaluate whether the blocks require multiple coats. Mine did. And so I really only got through the painting process in the first day of crafting. After the paint is dry, you can begin with your first side of mod podge. Before you begin with the sticking you want to arrange your rectangles in an appealing way. If they are different sizes you will want to play around with how to organize them. When you have organized the order of the blocks, you can begin with the mod podge. I always add a dab of mod podge to the block first to adhere the paper like glue. Then, once the paper is stuck onto the block go over the edges and the entire paper with the mod podge. At first it will look very gluey, but mod podge will dry clear. 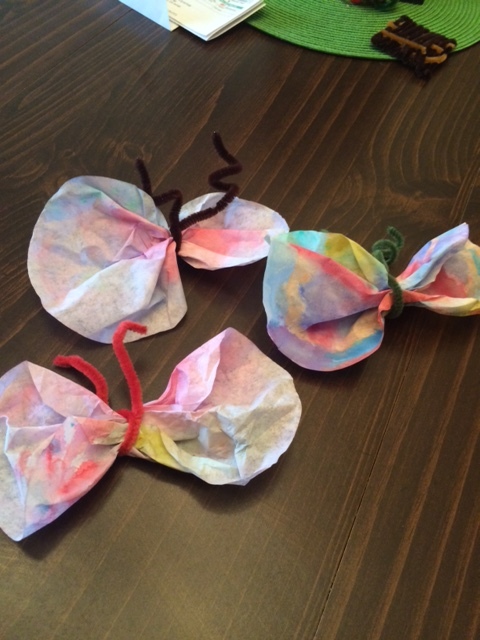 You want to make sure you have enough mod podge that the paper is secure, but not too much that the paper bubbles. Repeat the mod podge process for the entire name of the season. Then, before moving on to the next face or season make sure the entire mod podged face is dry. Important: When adding each new season be sure to keep the letters in the order you originally arranged! This was a fun little project. I plan to make some more in the future because it was so simple and I like the look of it. I know people who use a similar method to create Christmas calendar blocks counting down the 25 days of Christmas. I’ve also seen this as a popular gift for new parents who use blocks to either countdown to the arrival of their bundle of joy or to announce the time since their child was born in monthly photographs. I’m looking for some new ideas so if you have any other ways that simple blocks and mod podge could be used please share! This Sunday morning my husband is on the road with a basketball show and I am nursing my daughter back to health after an ear infection. This winter has brought sickness after sickness for my little girl, but on Friday we received some potential answers as to why. It looks like our little girl has allergies and all of these upper respiratory issues lately are rooted in that condition. For the third time in the past month I’m missing church again today so I won’t be posting a Covenant message. However, I do look forward to catching up via podcast later in the week. Today, my message was brought to me from my biblical coloring book, Live Loved. Jeremiah 31:3- I have loved you with an everlasting love; I have drawn you with unfailing kindness. Because God loves us with an everlasting love it means that He always has and always will continue to love us. No matter where we’ve been or what we’ve done His love for each of us is eternal. His unfailing kindness refers to the fact that while we may not deserve it He has chosen to love us anyway. When God looks at us He chooses not to see our sins and mistakes. Out of His unfailing kindness He chose GRACE. And His grace covers all of our weaknesses. I’m so thankful for a God who loves, forgives, and covers us with grace! It’s so easy to get into ruts. Every area of our lives is susceptible to the mundane. We can become so stuck on foods, routines, and shops that we begin to lose the excitement we once held for those things. In Ohio, the winter time can become a season of over-repeated family date nights. There are only so many things you can do in the great indoors with a toddler. When all else fails my husband and I resort to traveling to a mall so that we can walk, talk, and enjoy time together with the promise of a play area trip if our daughter is on her best behavior. As much fun as a trip to one of the area’s malls can be this past weekend we felt the need to branch out and try something new. The temperatures were cooler and the prospect of flurries lingered in the forecast. It was a weekend for indoor activities, but we were so over the idea of spending another Friday night window shopping and supervising our daughter in a sea of rambunctious children. After a quick Google search I found an Art and Clay Cafe in a neighboring town. Our daughter is absolutely in love with arts and crafts so it seemed like a trip that would be right up her alley. Indeed, the new adventure was well worth it. With our ceramic selections made we made our way to the paint table. Each of us filled a plate of vibrant colors and then took a seat where the baristas served us coffee and juice while we worked. I’ve forgotten how therapeutic painting can be. It’s been years since I just sat down and painted. All three of us were in such a zone as we focused on the projects at hand. I had completely forgotten about the nerve-wrecking Active Shooter Training that had happened in my school that afternoon. Our daughter had watched a program the week prior about mixing colors to make others so she really enjoyed experimenting with her colors. Somehow in the process of mixing multiple colors she manufactured the most beautiful shade of purple. She used this color to coat her dog and used so many other colors on the bird piece she worked on. When we finished with our projects we turned them in to the front desk. The pieces were queued for the kiln. The Art and Clay Cafe take all pieces and place a finishing gloss on them before heating them up in the kiln. Upon check out we received a ticket and a pick-up date. Next Saturday our beautiful creations will be done and ready to be brought home. I look forward to picking up our masterpieces. It was a unique Friday night. A family date for the books. We really liked the Art and Clay Cafe. Summer has begun and the search for toddler-friendly activities is in full bloom. Over the past couple of weeks my daughter has shown an expressed interest in art. She loves to sit and draw and her artwork is really beginning to resemble the objects she is intending to replicate. 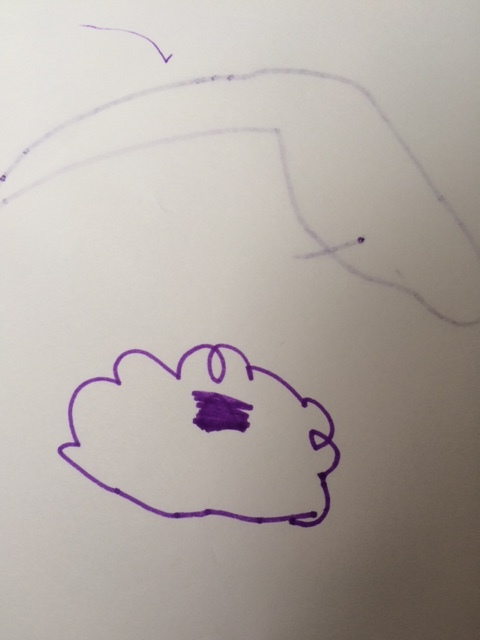 For example, earlier this week she drew this rain cloud for her dad. She explained that the dot in the middle of the cloud is all the rain getting ready to make us all wet. 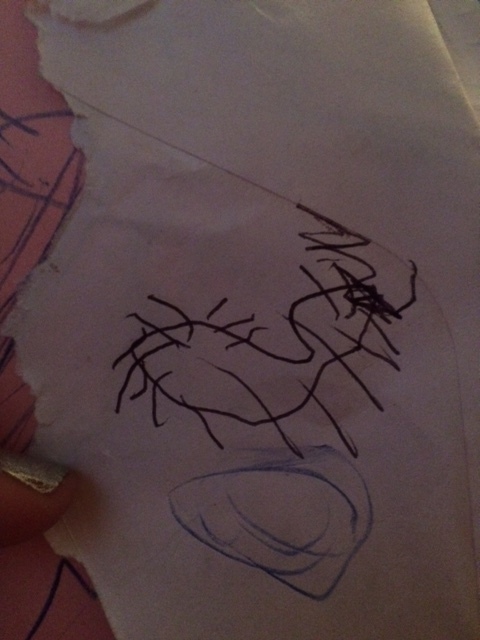 She also has been drawing caterpillars galore. This is her favorite thing to draw and she is getting really good at it. My daughter is only two and a half, but she is extremely interested in arts and crafts. For me I am a little challenged by this talent. I appreciate good art, but cannot create my own. Obviously, my daughter has inherited her abilities from my husband’s side of the family. 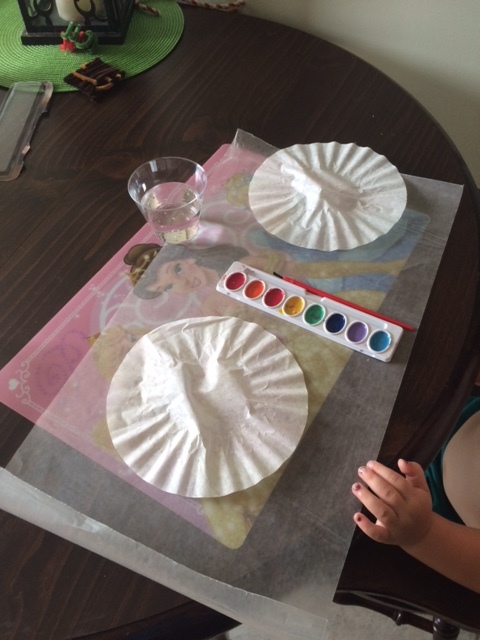 Now that I am on summer vacation I’ve planned out several ways to cater to my daughter’s artistic needs to help her expand her skills and learn some fun art forms. I went a little pin-crazy on Pinterest earlier this week and pinned a ridiculous amount of toddler friendly crafts. You can check out my board here.